If you’ve been struggling to grow your business in a vacuum or trying to solve problems that are beyond your expertise, Bill Arman and Ed Laflamme can help you! Become a Harvest Way Academy Member and get inside secrets from two top landscape business consultants and gain access to an online community of “green” industry peers. Every month you’ll receive comprehensive business tools and advice to grow your landscape company—right on your computer. It’s that easy. $29.95 value — yours just for signing up today! Limited number available — Once they are gone, they are gone forever! After signing up just head on over to the “Member Perks” tab in the member’s area. 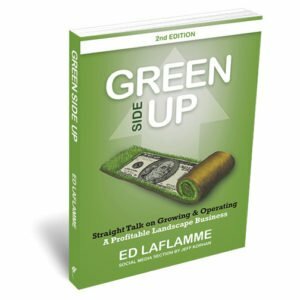 Ed Laflamme shares unparalleled insight into the multi-faceted world of a landscape business owner. Whether you re looking for ideas on running your business, managing your people, balancing your P & L, improving your operations or acquiring and retaining new customers, this book will motivate you to take action and chart a new course for your business.